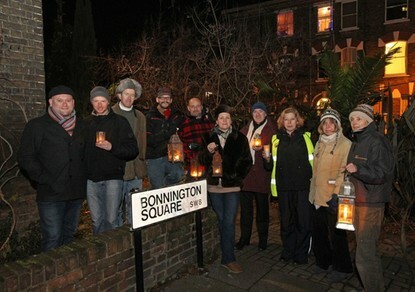 Residents have launched their own crime-fighting night patrols after a string of violent muggings and a carjacking in their south London neighbourhood.Up to a dozen neighbours in Bonnington Square, Vauxhall, have patrolled the area with lanterns and created a telephone helpline which lone women can call to be escorted safely home. Organised by resident Marie Johnson, they decided to “reclaim the streets” after reading in the Standard about patrols to beat the so-called Pimlico prowlers, street robbers who prey on women.Latest police figures show a rise in muggings in all but two London boroughs, while burglary rates are also rising across most of the capital. Bonnington Square has a higher crime rate than the London average. Police and a local councillor joined the neighbours patrol last week and helped them to install a new security light. Charlie Boxer, proprietor of the local Italo delicatessen, said: “Theres a real display of willingness to stand up to the muggers through people power. Resident Draeyke van der Horn, 42, a chef, said: “The incidents happened in areas that were quite well-lit. One lady was attacked as she walked into the square. Two men were trying the handles of cars and then they robbed her of her bag. Then last week a couple were held up in the same place. They think the mugger had a gun. “It seemed like we had a whole spate of thing that happened in a short period of time. Pizza delivery men were also attacked and the food was stolen. via Neighbours on night patrol aim to reclaim streets from muggers | News.